Six partner Universities of EU/UNDP Project “Community Based Approach to Local Development” won in the contest for the best activity plan of Resource Centers in sustainable development. Each university presented their activity plan during this year Annual review and planning meeting. Oleksiy Beketov Kharkiv national university for urban management, Uzhhorod national university, Cherkasy state technological university, National university “Ostroh Academy”, Zaporizhia national university and Sumy state university won in the contest. 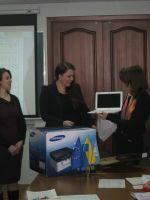 Resource centers get from CBA Project a set of office equipment – laptop and printer. During 2015 Universities and resource centers will hold trainings for students and postgraduates, field-visits to communities, student conferences. Resource centers will also develop necessary practical materials and methodological recommendations for students, postgraduates and lecturers.